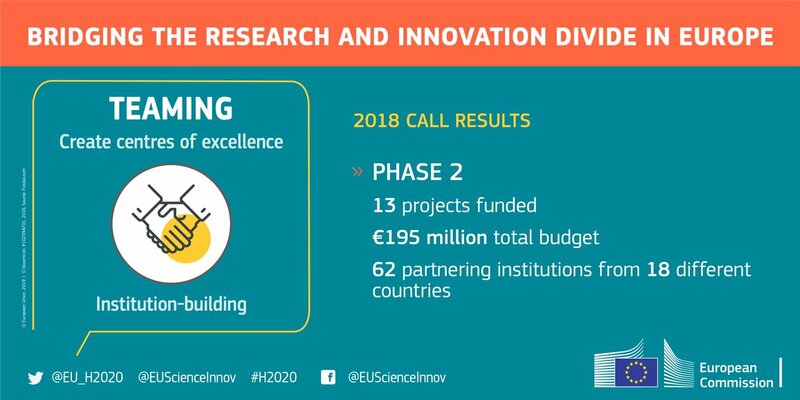 In order to improve the R&I performance, Horizon 2020, the EU’s research and innovation programme funds 13 projects located in Bulgaria (1), Cyprus (3), Czech Republic (2), Estonia (1), Latvia (1), Poland (3) and Portugal (2). The projects will each receive close to €15 million once the final grant agreement with the Commission has been signed in the second half of 2019. The grant will allow the new centres of excellence to form partnerships with leading scientific institutions across Europe in areas such as health, marine and maritime research, industrial production, biodiversity and nanomaterials. For example, the Bulgarian University St. Kliment Ohridski in Sofia with the project "GATE - BiG DAta for SmarT SociEtySE" will coorperate with Chalmers University of Technology and the Foundation Chalmers Industrial Technology, based in Sweden (www.gate-coe.eu). A set of measures with total budget of around €900 million is available for creating the conditions for widening the participation of universities and research organisations in less R&I-performing countries in the competitive calls of Horizon 2020. These include the Teaming, Twinning and the ERA Chairs instruments. Eligible Member States under Teaming include all those that joined the EU after 2004 plus Portugal and Luxembourg, as well as some of the non-EU countries associated to Horizon 2020. So far 11 Teaming Phase 2, 61 Teaming Phase 1, 97 Twinning and 27 ERA Chairs projects have been funded under Horizon 2020.